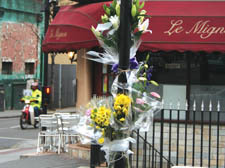 THE death of a 41-year-old motorcyclist in Camden Town has sparked condemnation of the council’s neglect of a notorious accident blackspot. Professional gilder and painter Alphonsus Sweeney, from Holloway, was killed when his borrowed Suzuki motorbike hit a two-ton frozen-food delivery truck at the junction of Delancey Street and Arlington Road at 7am on Friday. The collision happened just yards from a recent “road improvement” project carried out by council engineers funded by Transport for London after residents reacted with anger to statistics showing there had been 12 accidents there in three years. Friends of Mr Sweeney, known as ‘Fonzi’, who specialised in restoring ornate civic buildings and ballrooms, said he was a “sedate and careful” rider who was soon to be married. Mr Sweeney was travelling up Delancey Street from Camden High Street when he hit the lorry, which was on Arlington Road heading south. He was dragged under the rear wheels and declared dead at the scene. Barman Matt Risebero was asleep above the Crown and Goose pub on the corner of Delancey Street and Arlington Road when the accident happened outside. He said: “It’s terrible. A road sweeper and one of our regulars saw it happen and helped with the body. We’ve seen so many accidents there it has been a matter of luck there hasn’t been a fatality before. George Constantino, owner of the Camden Coffee Shop in Delancey Street, said: “I have been here 33 years and every year there are accidents there – it is a blackspot. Chairwoman of Delancey Street residents association Catherine Colley said that the council should urgently review its safety works in Delancey Street and questioned whether too many road changes were actually adding to the danger. Two years ago, the council canvassed residents and cycling groups for their views on the junction, and the nearby junction with Albert Street, because of the high accident rate. On Monday, a council spokesman said: “As part of a local safety scheme, Camden Council has undertaken work to improve the sightlines between traffic exiting from Arlington Road north side and traffic travelling on Delancey Street. This includes recently widening the pavement on Delancey Street on the north side just before its junction with Arlington Road – allowing motorists to see traffic approaching from Delancey Street. Delancey Street was sealed off for four hours on Friday as police from the Euston Collision Investigation Unit examined the scene and removed the truck for inspection. No arrests have been made in connection with the accident. A post-mortem was carried out yesterday (Wednesday). Police have appealed for witnesses to call 020 7388 6806.